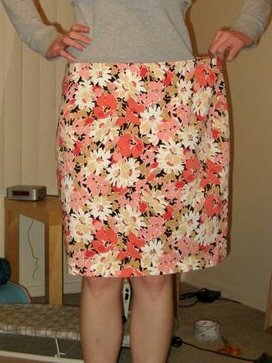 This pencil skirt didn’t refashion quite as easily as the A-line skirts I’ve been doing, the movement in the others is more forgiving in terms of fit. I briefly considered whether wearing this pink floral skirt is inappropriate for the beginning of winter, even toned down with a dark brown cardigan, and decided that if the weather allows it then I’ll wear it, even if it’s not “in season”. December 2, 2010. Tags: before & after, clothes, completed project, Goodwill, refashion, Target, What I Wore to Work Today. Pictures, Projects, What I Wore to Work Today, Words. December 2, 2010 at 7:55 am. Permalink.